Wear history, and reflect your personality, discover this exquisite Antique Sterling Cuff Bracelet with stunning hand~crafted details curated by Karen Lindner. Fabulous, bold, priceless ~ just like you! Truly spectacular, this exquisite solid Silver Cuff Bracelet dates to 1913. The Monogram on this piece is lovely, hand chased in scrolling romantic lettering and beautifully detailed, it has the letters A E B inside a circle. 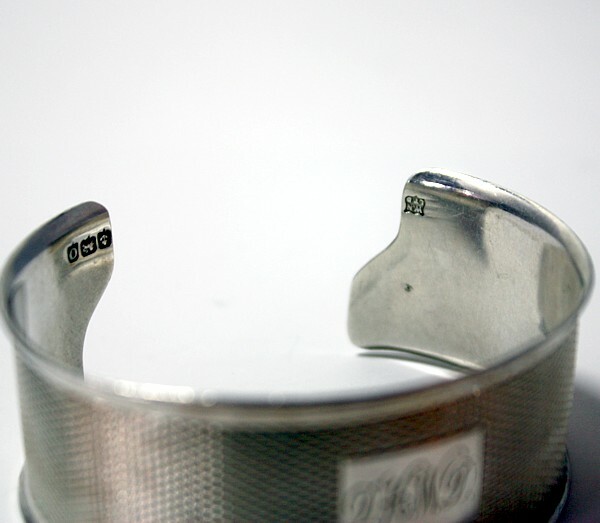 The band is decorated with detailed machining, this is a lovely classic bracelet. Highly collectible and fully hallmarked incl. the Lion Passant mark for Sterling, this is fabulous for you, or to give as a luxurious gift. Measures 1" h., fits a small wrist 6~1/2" ~7".